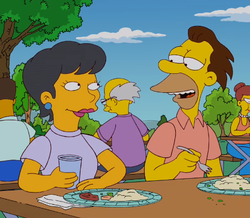 The female power plant employee is an unnamed employee who works at the Springfield Nuclear Power Plant. She attended Homer's "pardon me" picnic, and said that it was the best "I'm sorry" party he's ever thrown. Lenny then asked her "who the hell" she was. Modified on March 5, 2019, at 20:18.